Fifteen-year-old Farrin has many secrets. Although she goes to a school for gifted girls in Tehran, as the daughter of an aristocratic mother and wealthy father, Farrin must keep a low profile. It is 1988; ever since the Shah was overthrown, the deeply conservative and religious government controls every facet of life in Iran. If the Revolutionary Guard finds out about her mother’s Bring Back the Shah activities, her family could be thrown in jail, or worse. The day she meets Sadira, Farrin’s life changes forever. Sadira is funny, wise, and outgoing; the two girls become inseparable. But as their friendship deepens into romance, the relationship takes a dangerous turn. It is against the law to be gay in Iran; the punishment is death. Despite their efforts to keep their love secret, the girls are discovered and arrested. Separated from Sadira, Farrin can only pray as she awaits execution. Will her family find a way to save them both? 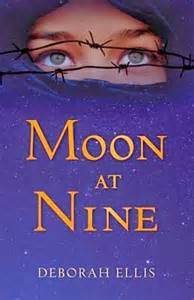 Recommended by a colleague, Moon at Nine tells the heartbreaking story of Farrin and Sadira; teenage girls in love in 1988 Iran. I must say, I learned a lot from reading about the culture and Farrin`s very different set of experiences. For instance, Farrin`s parents throw dinner parties to drown out the sound of nearby bombings, and she regularly attend school remembrance ceremonies for classmates. I have grown accustomed to hearing news reports about political upheavals and violent demonstrations, but reading about the characters and knowing that the book is based upon a true story really struck me. Sadira and Farrin`s love is true and strong; and they decide to risk everything (including their safety) to be together. I loved reading their secret notes, and their strategy to communicate `I love you` by coughing three times. They remain true to themselves, even though being gay is against the law and punishable by death in 1988 Iran. It`s definitely a story that needs to be told, and a sad reality that being gay is still considered a criminal offence in more than 70 countries. The final outcome of their story was tough to swallow. Even though Moon at Nine is a short and quick read; it is one that will stay with you for a long time. I can definitely see this book being used in the classroom to explore cultural and LGBT issues. Ellis even includes Book Guide Questions to start the important and thought provoking discussions to engage youth. Better Nate Than Ever has racked up an impressive list of honors and awards. Although targeted at middle graders, readers of all ages will enjoy this hilarious book. Through Nate’s eyes, readers are given a glimpse of how fabulous New York City can be. It brought back memories of navigating the busy streets, and experiencing the wonder and magic of the bright lights, loud noises and interesting smells! Nate’s NYC audition adventure reminds us all the have the courage and heart to follow our dreams. He is quite the comedian, and I found myself laughing a long with him. Although there are plenty of laughs to be had, Federle also covers serious ground through Nate’s questioning sexuality and his mothers’ unresolved family conflict that has hindered Nate’s relationship with his Aunt Heidi. I too have experienced family tension with an estranged aunt, so I could totally connect with Nate and cheer for their reconciliation. I thought both serious matters were handled perfectly and age appropriately. Although Nate hints at his sexuality, it is never declared. In fact, Nate asserts, “I am undecided… and frankly don’t want to declare anything other than ‘Hey, jerks. I’m thirteen. Leave me alone. Macaroni and cheese is still my favourite food-how would I know who I want to hook up with? (p.27)” YES! I think Federle deserves a BIG round of applause for including that line. I urge you to pick up this hilarious and inspiring book. 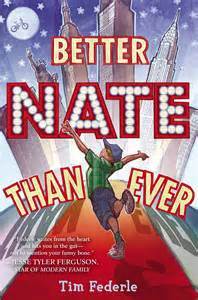 I can’t wait to read the sequel- Five, Six, Seven, Nate! to find out about Nate’s showbiz debut! From Goodreads: When Cameron Post’s parents die suddenly in a car crash, her shocking first thought is relief. Relief she’ll never have to tell them that, hours earlier, she had been kissing a girl. Expected publication: February 7th 2012 by HarperCollins. First off, thanks to Helen from Library Bound Inc for the ARC of this novel. I was intrigued when she raved about the ‘compelling romance, strong characters and relentless suspense’. As much as I wanted to love this book, I just found it OK. I must admit that I did a lot of skimming while reading this lengthy 467-page book. I found it very richly detailed/character driven which ultimately affected the pacing of the story. Yet, I do know some readers that prefer tons of detail so it does boil down to personal taste. Second, I disagree with the publishers recommended rating of aged 14+. There were some pretty graphic scenes (drug use, sexual nature, self mutilation) that made even myself uneasy. However, that being said, this is not a light and fluffy book. This is an important coming of age story of twelve-year-old Cameron Post as she questions her life and the world around her. Since there aren’t that many books for LGBT youth, I’m so happy I now have another option to recommend. If placed in the right hands, this book could make a huge difference in the life of a questioning teen. This leads me to my last issue with the book. Nowhere does it blatantly reassure the reader that sending someone away to ‘fix’ them for being gay is NOT OKAY. Not then, and definitely not now. On the flip side–In addition to the beautiful cover, there are some pretty fantastic elements in The Miseducation of Cameron Post. I loved the little special visual additions such as the ‘God’s Promise’ flyer, Cameron’s iceberg therapy drawing and a hand written note from her friend Jamie. It was an appreciated break from the text. Although lengthy, the novel was very well written! In fact, so well written that I can’t believe it was Danforth’s literary debut. Overall, I’m glad more books like The Miseducation of Cameron Post are being published and gaining attention. Despite my critiques, it’s definitely worth a read. Click here to access Harper Collins’ online book club guide.